Home » Yay these four new vegan places will open up soon! Vegan food is continually getting more popular in Amsterdam. It’s more common to find a vegan option on restaurant menus, but also there are more vegan spots popping up! These are some new vegan places opening up real soon! End of the month Pita 3.0 will open at the Overtoom. 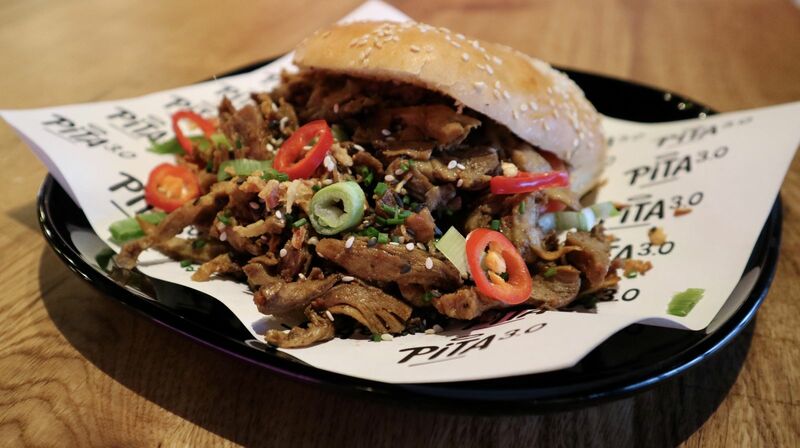 A fully vegan place, serving it’s signature dish of döner kebab but also loaded fries (‘kapsalon’) and baklava! Also there will be various local beers on draft, the space itself won’t be like your regular snackbar! Opening date is in two weeks! Not a fully vegan place, but they call themselves a plant-forward restaurant. Meaning veggies come first! Vegan menu is the standard, animal based stuff is just in the side dishes. With chefs who worked at renowded restaurants in town before, expect some mindblowing food! When Vegan Junk Food Bar opened April 2017 they took the world by storm. Thanks to a heavy Instagram presence and consistent quality of their next level vegan junkfood, they quickly became so popular that they opened a second restaurant. And now a third one is on its way! They didn’t reveal the exact location yet but it will be close to Dappermarkt at Amsterdam East. And like the second restaurant also this place will have an iconic mural by local graffiti legends Brush and Oase. Below is a little sneak peek. The opening date is still unknown but it must be soon! The owners of popular vegan lunchroom Dophert announced plans for another restaurant. With a different name and concept and set in neighbourhood De Pijp. Deer Mama will be a ‘mylk’ bar by day with breakfast, lunch, cakes and soft-serves. By night it will turn into a burger bar, including local draft beers and boozy milkshakes! The location is still a secret but it will be close to the busy Albert Cuyp market and Ceintuurbaan. Plans are to open up before summer. In order to achieve this they started a crowdfunding campaign. And if this restaurant proves itself to be succesful, the ambition is to open up similar restaurants in other cities as well!